Welcome to Teen Drivers Ed Online in California! Our course is Certified and Approved by The California DMV. 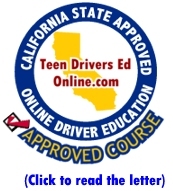 Teen Drivers Ed Online in California is a comfortable and cost-effective way to teach teens proper driver education with our online course. We know you will enjoy our interactive videos and highly informative curriculum. You can take the course at your own speed. Our affordable online drivers education program is designed not only to help you receive your Drivers Ed Certificate, but to help you "Ace" the DMV permit test, which can be pretty tricky. Don't forget you can take the test as many times as necessary, and enjoy our informative videos without any extra cost to you. We are your affordable choice to teen drivers education online and obtaining your learners permit in California. Upon completion of the online drivers education course we will mail you the DMV completion certificate. This is the same one you would receive if you took the course in a classroom. Take the pink DMV certificate, your birth certificate and your social security number to the DMV in order to take and pass your permit test. Click the "Enroll Now" button above to see if it is offered in your area. Teen Drivers Ed is a California statewide program. We are a proud Allstars Driving School teen driving online drivers ed driving school affiliate. Allstars Driving School is licensed and registered with the California Dept. of Motor Vehicles license #4434. In some California counties (current Placer, Sacramento, and parts of El Dorado and Yolo counties), we offer additional training for behind-the-wheel assistance. If you live in one of these areas, sign up now and receive our course absolutely FREE with the purchase of the required six hours of behind the wheel training! Enroll today!